A rejuvenating night time moisiturizer and age-defying serum combined in one light and silky cream. Part of the GLOW -Ultimate Antioxidant Nutrient Complex Skin Care System. Agents in this formula have been shown to exhibit the following activity. THESE STATEMENTS HAVE NOT BEEN EVALUATED BY THE FOOD AND DRUG ADMINISTRATION. THIS PRODUCT AND THESE STATEMENTS ARE NOT INTENDED TO DIAGNOSE, TREAT, CURE OR PREVENT A DISEASE. 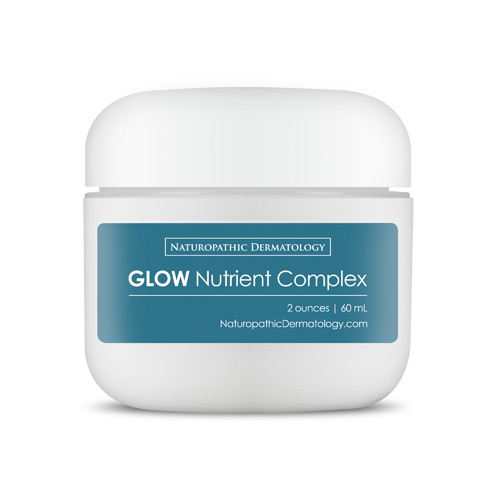 Dr. Lamothe recommends evening application of GLOW Nutrient Complex to freshly cleansed facial skin. Apply a thin layer and spare the eye area. Rinse face in the morning, pat dry and then apply Ultimate Antioxidant Nutrient Complex as a rejuvenating antioxidant day cream. Extra sensitive skin may need to apply differently from standard recommendations. Do not apply GLOW to inflamed, irritated skin. Refer to the package insert for appllication instructions or send us an e-mail if you have questions about the use of GLOW and your skin type. Water, Organic Aloe Vera Whole Leaf Juice, Safflower Oil, Glycolic Acid, Unrefined Shea Butter, B Nutrient Complex™, Lactic Acid, Plant Emulsifying Wax, Vegetable Stearic Acid, Vegetable Glycerin, Rosa Rugosa Extract, Silver Dihydrogen Citrate, Citric Acid, Potassium Sorbate. Wonderful product!! My skin really does glow and even out when using this product. It does sting so I recommend waiting to apply at least 10 min after washing face. My absolute favorite product of all time! It works like a reset button for your skin. In less than a week, your skin looks fresher and feels softer. I like the tingle when it goes on my skin. You don't need to slather on a thick layer: just use a light touch. It's not greasy, nor does my skin feel tight, just feels flower petal soft. Love it. I have just finished my first jar of glow nutrient complex. I am so excited about how I look. This product has made my skin look smooth reducing fine lines. My face feels moisturized and I am not getting those little white bumps. This product has even reduced those which I was getting from my previous skin care products. I also like that it is developed by a naturopathic dermatologist . Thank you for making such a wonderful product.